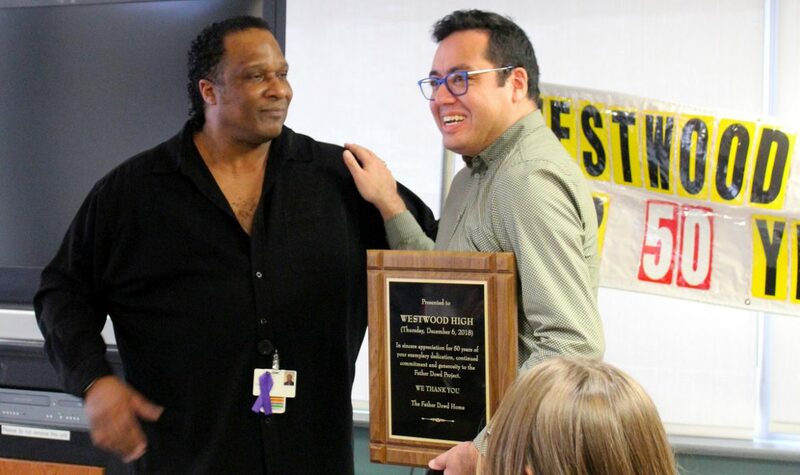 Father Dowd Recreation Therapist Ray Cassell (left) presents a plaque to Jason Cordery of Westwood School to mark the 50th anniversary of the annual holiday tradition of students visiting residents. For the 50th year in a row, a school bus dropped off students, teachers and bags filled with gifts just in time for the holidays at the Father Dowd Residential Centre. For half a century, students from off the island have brought holiday cheer to residents at the long-term care centre. The youths sing festive carols and offer the residents individually wrapped presents. This year, students from Westwood High School in Hudson, Saint-Lazare surprised residents with a new, fully decorated Christmas tree. They also passed out seasonal gifts such as blankets, slippers and cuddly toys to keep residents warm over the holidays. The annual intergenerational holiday tradition—known as “The Father Dowd Project”—has been a true labour of love for Father Dowd’s Recreation Technician, Ray Cassell, who has been organizing the event for four of the last five decades. 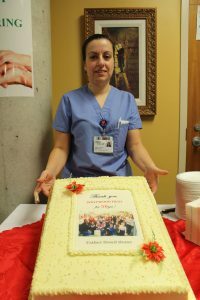 Cynthia Soares of the Father Dowd Housekeeping Department displays her creation, a 50th anniversary cake specially baked and decorated to mark the occasion. Many special guests visited Father Dowd to commemorate the landmark event, among them Richard McBrien, the retired teacher who first brought his students to visit the residents at Father Dowd in 1968. At the time, the Father Dowd Residence was located on de la Gauchetière Street. Mr. McBrien’s wife had urged him to visit with his students, after she met one of the residents at St. Patrick’s Basilica, which was located nearby. Mr. Cassell coordinates the annual holiday visit with Jason Cordery, the spiritual animator at Westwood School. On the occasion of the 50th anniversary of the tradition, Mr. Cassell presented a plaque to Westwood School in appreciation of their annual visits to Father Dowd. 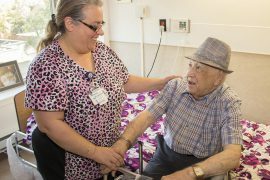 “I find it so refreshing that young students are willing to take time out of their busy lives to make this annual visit so pleasurable for our residents,” Mr. Cassell says. Barbra Gold, the Director of the Support Program for the Autonomy of Seniors (SAPA), also expressed her thanks to the students and faculty of Westwood. 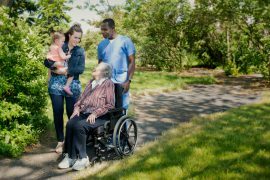 She then issued a challenge to their peers in other schools to visit long-term care sites in our network. “Maybe seeing an event like this will encourage other schools to start programs with seniors similar to ours,” Ms. Gold told the crowd. After the residents enjoyed their one-on-one visits, the students were treated to a buffet lunch. Its highlight? A cake was served displaying a photo of students from the 40th anniversary visit. 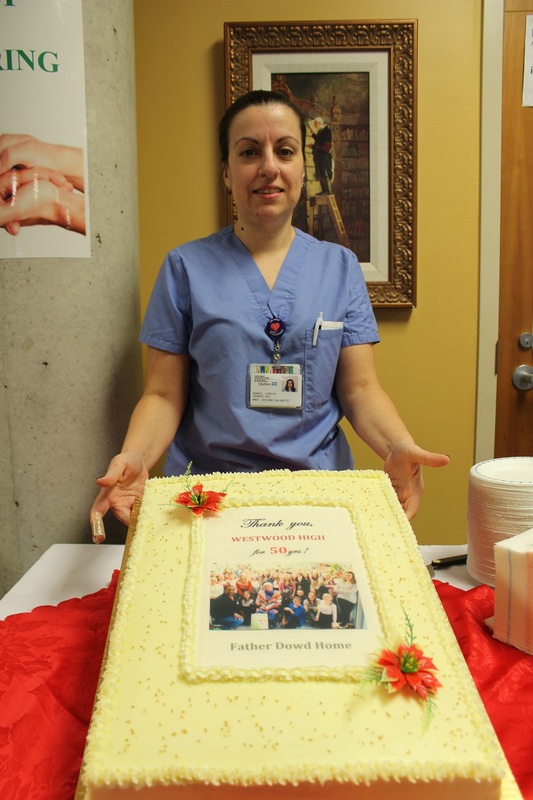 The confection was baked and hand decorated by Cynthia Soares, the Housekeeping team leader for Father Dowd. Mr. Cassell spoke about his gratification in watching the warm and spirited interaction between the Father Dowd residents and students.